Today was a rough day. I helped one of my dearest friends (who just happens to be family) move herself and her children out of their home. Piece by piece we carried her life out the front door and placed it on the lawn. As she stood back and looked at their things … their life … laid out … displayed for all to see, tears filled her eyes. I stood by her side wanting so badly to say something that would ease her pain, but what do you say to someone who is walking down a road you’ve not traveled? Someone who is experiencing something you’ve never experienced? The level of hurt and disappointment she must have been feeling as she stood there, staring at the house where she had planned on raising her children, the house that was once their home. Even now I can’t even begin to imagine how that must feel. I’m no stranger to loss and the pain that accompanies it, but this was something else. Divorce … what a difficult thing to endure. Two people who were made one were now going their separate ways and the wounds were becoming evident in both. Sometimes we get so focused on the pain someone has caused us that we lose sight of what’s really important. Our pain blocks our purpose, and for Christians, our purpose is glorifying the Father. We cannot do that if we choose to harbor bitterness in our hearts. When we allow bitterness to take center stage, we allow Satan the opportunity to win twice – once, by succumbing to temptation, and twice by making ourselves unavailable to the Father. Why do we allow this to happen? The harsh reality is that man cannot separate something God joined without causing some damage, sometimes irreparable damage. But there is hope for healing through the shed blood of Jesus Christ. Do we experience pain? Unbearable and excruciating pain? Absolutely! But there is no amount of pain that we will or can ever experience on this earth that would ever compare to the pain Jesus felt as He bore the punishment for our sins – mine and yours. The precious blood of Christ frees us from Satan’s grasp and places us in the kingdom of God where we can stand before His throne, clothed in robes of the purest white, where we will lay our crowns at His feet. Why would we sacrifice that opportunity, His crowns, for fleshly feelings? To have nothing to offer the One Who offered it all simply because we choose our feelings over His freedom. What fleshly feelings do you need freedom from? Are you willing to exchange them for something worthy of placing at His holy feet? Is whatever you are choosing to harbor worthy of every drop of blood He shed? Or are you boxing the air? Father, today I come to You seeking forgiveness for my feelings of entitlement. I’ve desired for so long for people to see the true colors of the ones who have hurt me, when in reality I’d be devastated for my true colors to be seen. 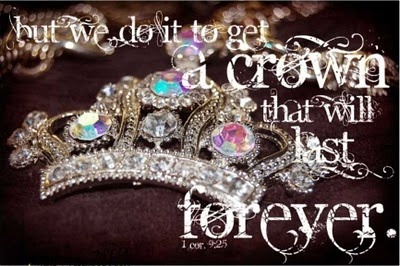 I can’t help but think of the crowns and treasures I’ve left in the battlefield because I was unavailable for Your use. Today I pray that Your Spirit will have victory over my flesh. I pray that I will become a slave to Your leading that I may remain an eligible participant in this race. For it’s in Jesus name I pray … AMEN!